Compact neat shrubs with small flowers are valuable plants for providing textural contrast in the border. A gardener is typically drawn to plants with large flowers or dramatic foliage. However, too many of these plants can create an overwhelming effect in the garden. The best effects are always achieved when the gardener bears in mind the principle of contrast – and this applies to foliage size, shape, colour and texture. Foliage is the important issue – after all, no plant is in bloom all year round whereas foliage is there much longer, in fact, throughout the year if it is evergreen. If you have a plant with large leaves, plant it next to one with small leaves in order to show it off to best advantage. If the flowers are gorgeous but the leaves are insignificant, plant a shrub with colourful foliage next to it. In a similar manner, contrast furry leaves with plain-textured leaves, glossy leaves with matt leaves, fernlike leaves with plain oval leaves. No one has difficulty choosing the star performers, but the less conspicuous shrubs are not so well known. Two versatile shrubs for providing background contrast are the confetti bush (Coleonema species) and star dust bush (Cuphea species & cultivars). Both have dense foliage that is either green or golden, depending on the cultivar, and small flowers. In addition, they can both be clipped to form a hedge – a low one in the case of cuphea, a medium height one in the case of coleonema. Coleonema ‘Sunset Gold’. Golden foliage and pink blooms. Height: 50cm. Spread: 30cm. 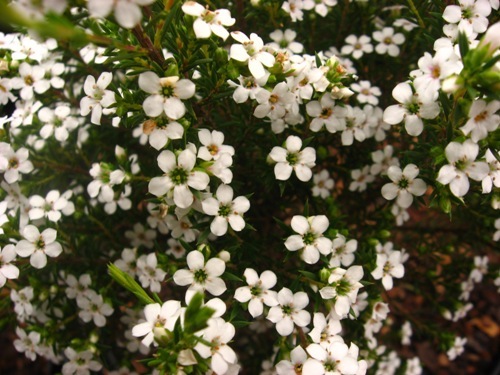 These shrubs are small and compact with small oval leaves. 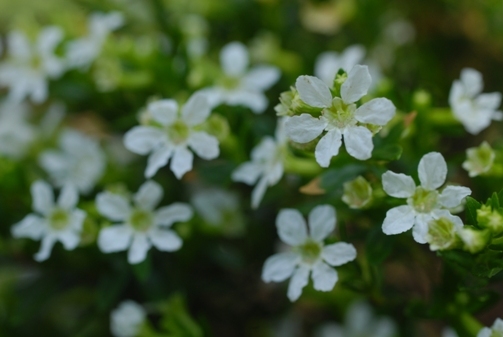 They bear tiny flowers from spring till autumn. All Cuphea species prefer full sun but will grow in partial shade. They only tolerate mild frost which makes them lose some of their leaves. Their height is about 30cm, with a similar spread. Cuphea hyssopifolia ‘Cocktail’. Yellow green leaves and purple flowers. Cuphea hyssopifolia ‘Lemon and Ice’. Lemon yellow foliage and white flowers. Cuphea hyssopifolia ‘Lemon Squash’. 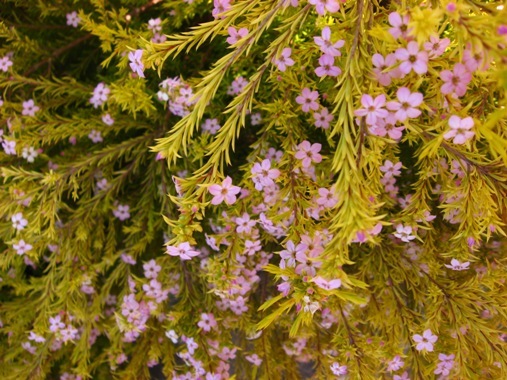 Light green-yellow foliage and pink-purple flowers. Cuphea mexicana ‘Lilac Wonder’. Green leaves and purple flowers. Cuphea mexicana ‘White Wonder’. Green leaves and white flowers. Cuphea illavea flamenco ‘Samba’. 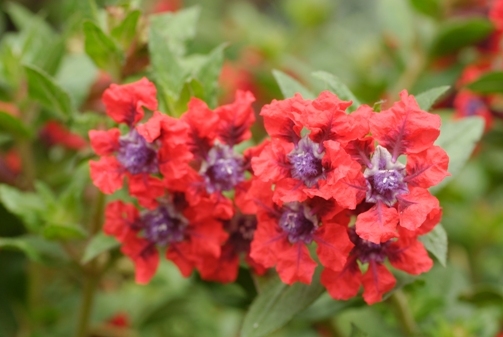 With a height of 40cm and a spread of 60cm, and red blooms somewhat bigger than those mentioned above, this makes an attractive hedge or container plant.